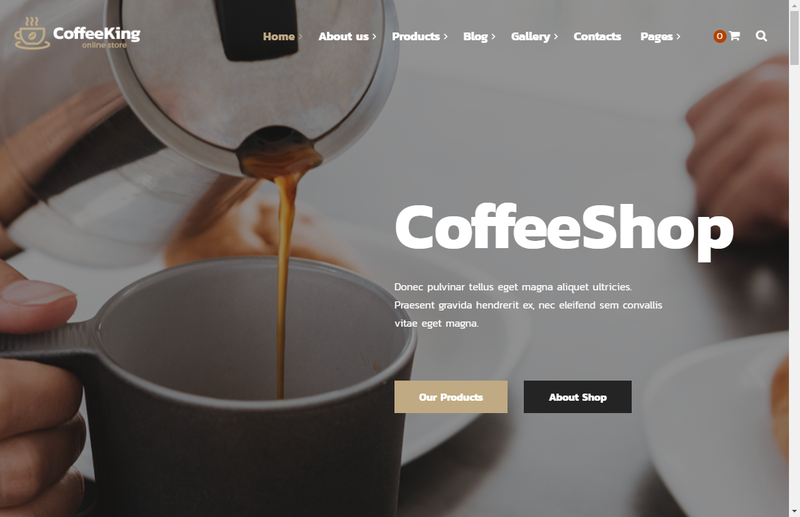 This weekend, for your consideration, we’ve gathered up the best WordPress coffee shop themes and café themes. 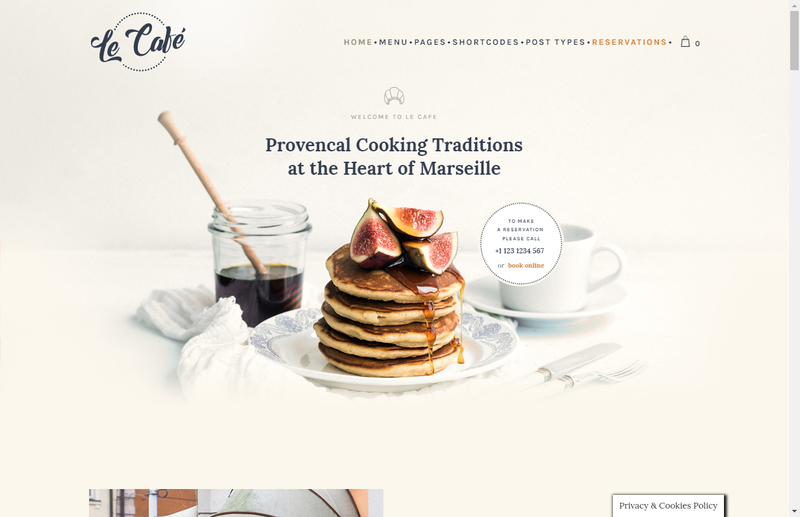 There’s no shortage of restaurant and food-oriented themes that would do the trick for a coffee shop website, but to make this round-up as useful as possible, we’ve narrowed it down to WordPress themes designed specifically with cafés and coffee shops in mind. Though there’s still a bit of crossover, we’ve decided to leave other food service related themes (bistros, dining, wineries, pubs) for another post. All themes were selected by hand, based on design quality and features. As with many of our lists, there is a loose order here, but any of these themes would be a good choice for your café’s website. Before we get started: if you’re starting from scratch, and aren’t sure you want to use WordPress, you may want to consider using a cloud based website creator. Check out our comparison of WordPress, Wix, Weebly, and Duda. Restaurant Cafe is a versatile product, with designs for sushi bars, food shops, gourmet restaurants, and of course, coffee shops. The design is contemporary and cool, and Gutenberg compatible. The theme isn’t only responsive, but fully Retina compatible, guaranteeing a crisp and consistent user experience across the full range of modern devices and computers. It includes a menu and reservation plugin, a parallax builder, and beautiful animations. There is WooCommerce store support, and a one-click installer. This one is definitely worth a try. 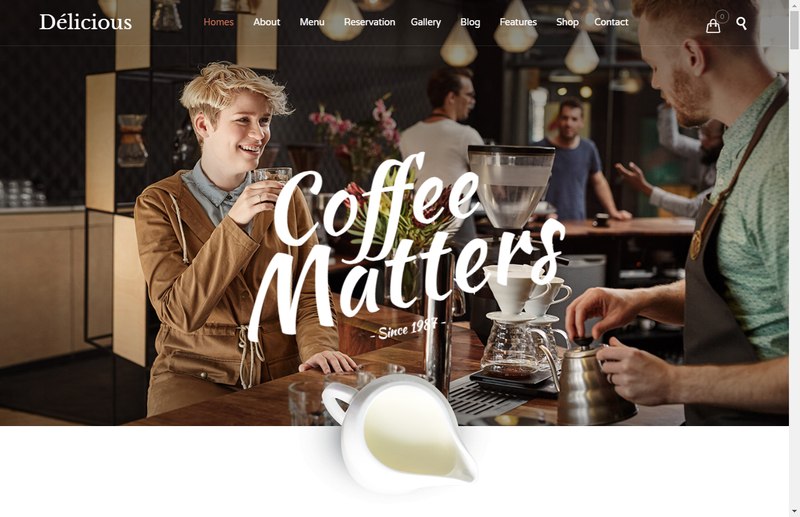 Hot coffee is a WordPress café and coffee theme featuring a light, clean aesthetic that also adapts well to use by bars, restaurants, bakeries and more. The design is minimal, but full of character. Gorgeous fonts, plenty of white space, and subtle animations are sure to make an impression on your visitors. 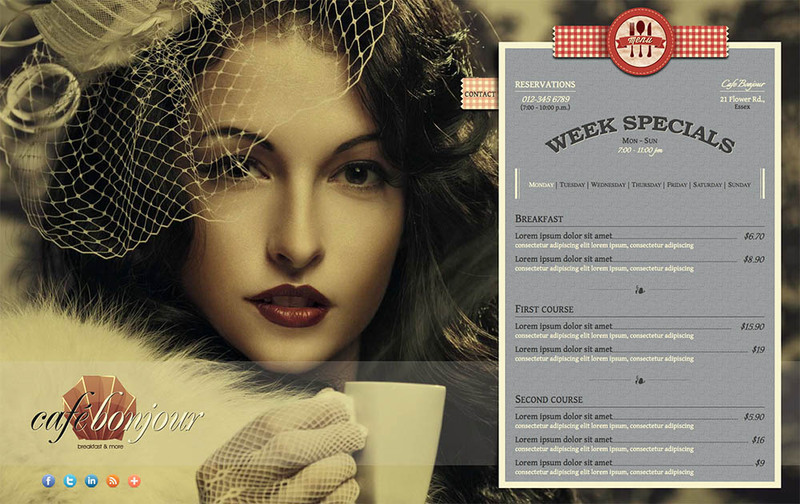 The theme is compatible with the excellent Booked plug-in, allowing your customers to reserve tables online. With hot coffee, you can even take food & coffee via your website, thanks to full WooCommerce integration. Theme is easy to install, run and update, and it’s highly customizable. It’s user-friendly, and performance optimized. A nice selection of custom widgets, custom shortcodes, and Visual Composer support (for drag-and-drop page building) extends the flexibility. Revolution Slider, Swiper Slider, Essential Grid, and FoodPress are all supported. Well documented and regularly updated. 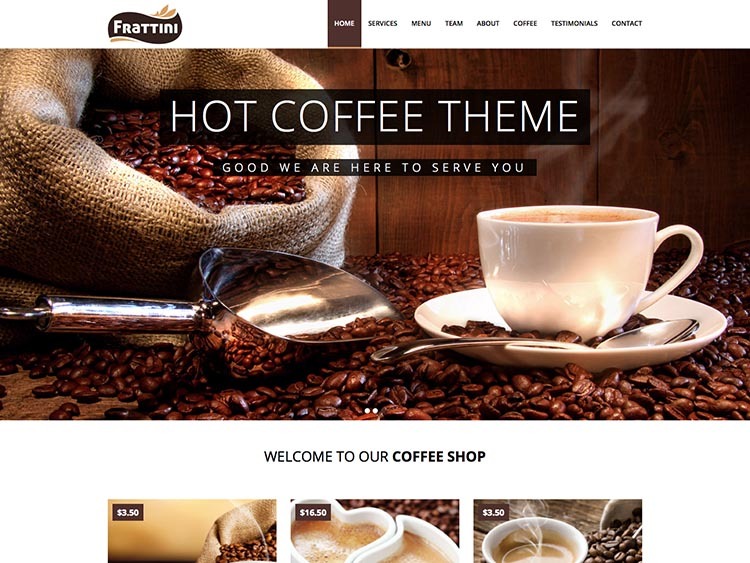 A simple, easy to use, but extremely versatile theme, CoffeeKing is perfect for any business that does anything with coffee. There are multiple separate designs for coffee shops, markets, and stores. CoffeeKing is highly rated by users, and includes tons of bonus features, such as Visual Composer, and WooCommerce and MailChimp integration tools. We love this theme because it looks so nice on both desktop and mobile, and the support is second to none. This one should definitely be at the top of your list. Next up is Dhaba, first released in May. 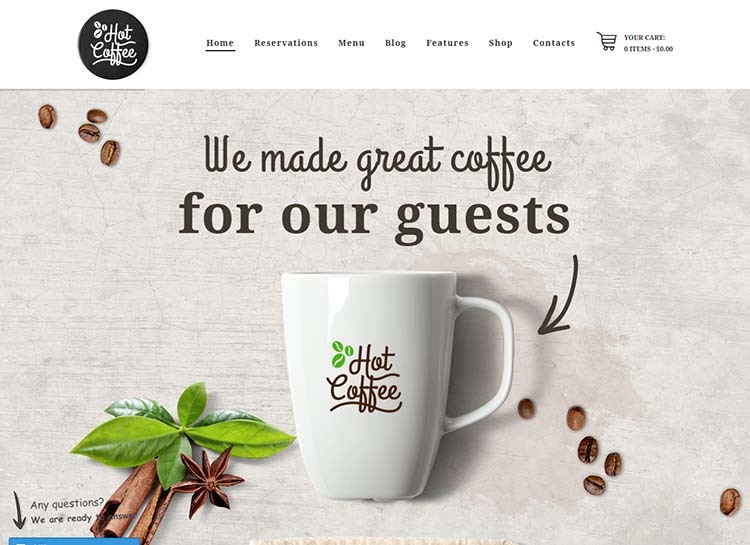 This restaurant, cake shop, and coffee WordPress theme provides everything you need to build a classy, engaging website for your coffee shop business. Three different homepages are avaiable out-of-the-box, and support for Visual Composer gives you the power to build and manage unlimited layouts. On the backend, webmasters can codelessly brand and customize their site, with access to unlimited colors and advanced typography options. WooCommerce is integrated for online sales, and table booking management is provided. The theme is 100% responsive and translation ready. Described by the developer, CMSSuperHeroes, as “elegant, modern, and functional”, this responsive parallax theme is one of the newest on our list. Events management and reservation management are included features. Support for an online shop is included (WooCommerce), in case you want to sell some branded hats and t-shirts. Or maybe you’re marketing your own special blend. This one’s going to look great on all devices because it’s retina-ready. There’s lots of flexibility and room for customization here too. The premium plugin Visual Composer is packaged with the download for drag & drop page building. The premium plugins Revolution slider and Essential Grid are included too. Nuvo is translation ready, and comes with extensive documentation and one-click demo installation to get you going. Kataleya is another recent theme. 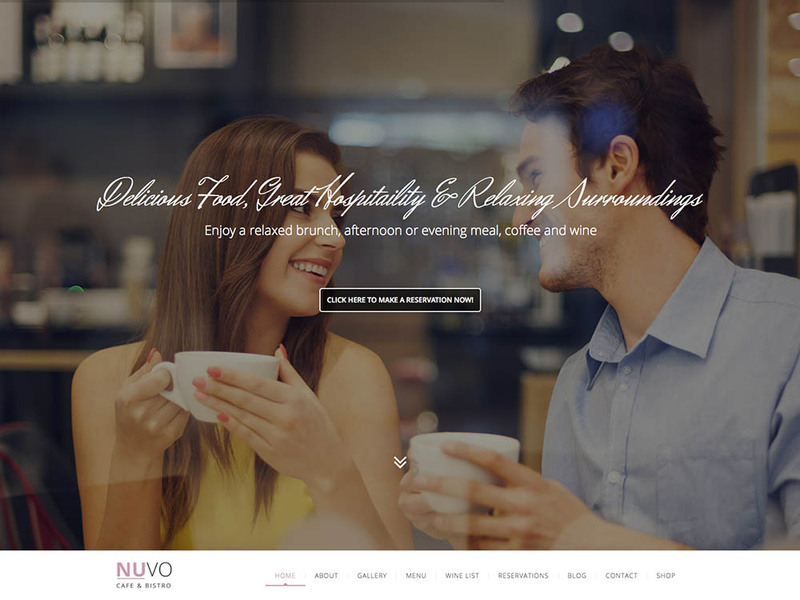 Designed in a contemporary, one-page style, it features large, eye-grabbing photos and parallax effects (similar to the Nuvo theme). It’s also comes with three preset variations: one for coffee shops, one for a pizza house, and one for a general restaurant use. Visual Composer and LayerSlider are included as bonuses, and a custom reservation system is there if you need it. You can setup your menu easily with shortcodes, and a fully functional online ordering plugin comes with the theme for easy order management. There’s lots of customization options available on the back-end too, including four preset color schemes. The theme is retina-ready and responsive, meaning it will look clean & sharp on the latest high-resolution devices, and it will work flawlessly across the full range of mobile devices. Users who want to do a bit more customization can take advantage of the back-end control panel to tweak colors, fonts, and more. The theme is well documented and easy to install and setup with the included demo data. A good option for WordPress beginners. 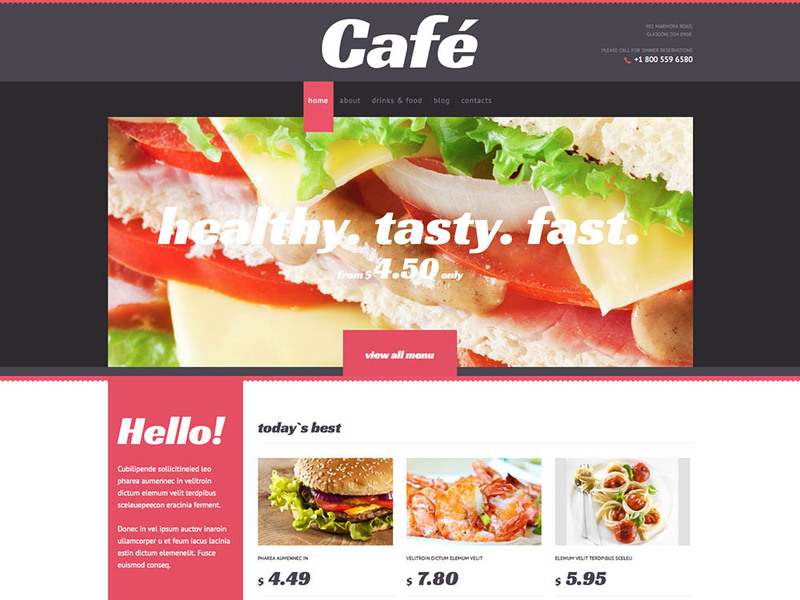 Le Cafe is a gorgeous theme designed just for cafes and coffee shops. The default design is modern and minimalistic, with clean lines, bold fonts and lots of open space, but the real strength of this theme is in its beautiful pages and its usability. There are gorgeous Retina menu pages, an excellent (and beautiful) shop, and integrated tools like a form builder and drag and drop page designer. 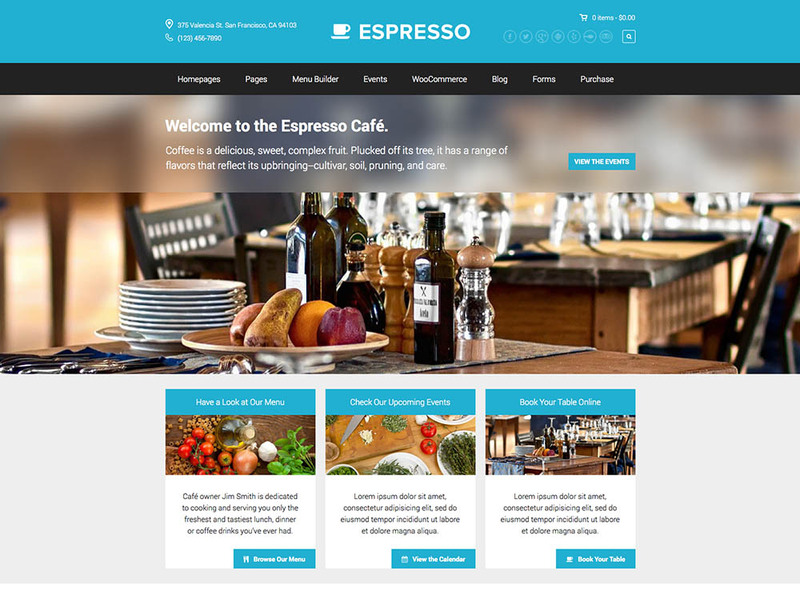 The Espresso theme is slick, flat design theme by BoxyStudio, one of our favorite ThemeForest developers. Their simple, modern themes include everything you need to build your coffee shop or cafe website and then include a few more things just for good measure. There’s a lot of value to be found in the bundled premium plugins alone. Soliloquy slider, Envira Gallery, Visual Composer and Slider revolution are all included. The theme also supports WooCommerce and Event Calendar. Unrelated: the name reminds me of this one time a barista shamed me for pronouncing espresso “expresso”. It was about fifteen years ago and I still think about it every time I hear the word. I wasn’t even ordering for myself! I don’t drink espresso! Anyway, a menu builder for restaurants is supported, something called a ‘Blur’ slider (which is pretty cool) and a few other bells & whistles round out the features. Great value. We’re pleased we could put Bonjour on our list, because it’s layout deviates from the more ubiquitous corporate/business layout we’ve seen in many of the themes so far. It’s vintage aesthetic adds to impact of the design. It’s a single page, and does away with many of the extraneous features typical of ThemeForest products. If you’re the type of person who has a tendency to waste time tweaking options and rearranging layouts (as I am), you might want to seriously consider this one. 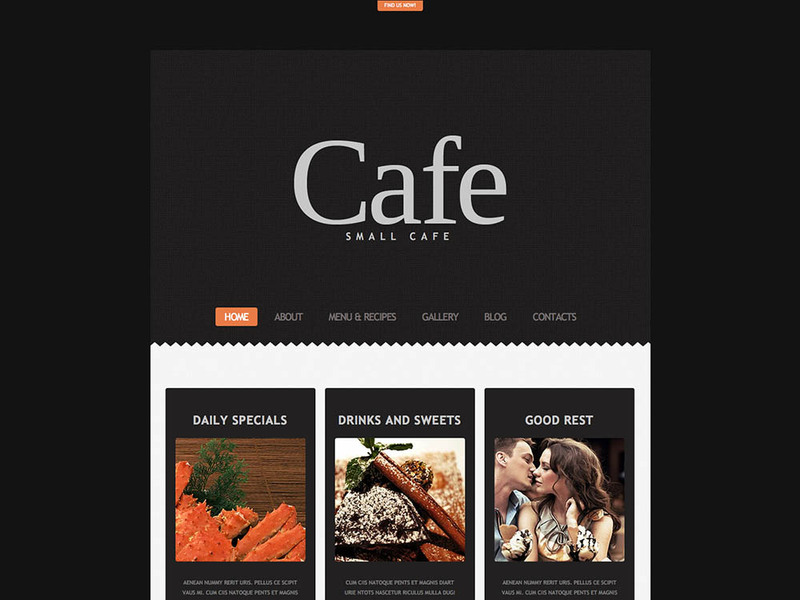 Café is a minimalistic, easy to use WordPress coffee shop theme sold by TemplateMonster. TemplateMonster themes don’t offer as much in the way of features when compared to ThemeForest, but the paid add-ons like installation and hosting (at reasonable prices) make them a good choice for users who don’t want to deal directly with WordPress and would rather let someone else handle it. Another clean, cool looking theme from TemplateMonster. Again, as we noted above, TemplateMonster themes are better suited for users who don’t have WordPress experience and would prefer to let someone else install the site. A good option for novices who want a great looking site for their coffee shop, but fear getting lost by tackling it themselves. 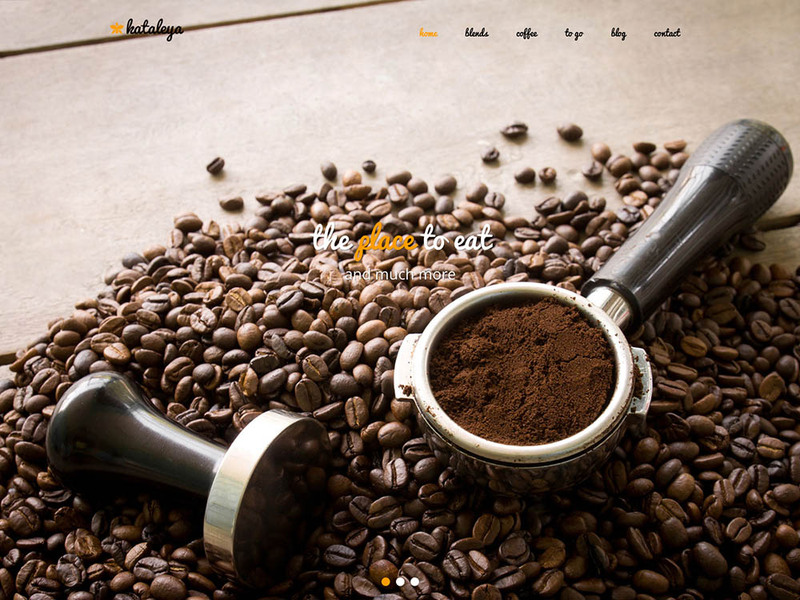 Well, dudes and dudettes, that’s it for our list of the best WordPress coffee shop themes. Give us a heads up in the comments if we missed anything. Or if you’re lonely, I guess.